1. How did you come to work at Enova? Back in 2013, Enova had come for campus recruiting at Georgia Tech where I did my Ph.D. I had stopped by the booth and thought it was an interesting company, but since I was more than a year away from graduation, I didn’t apply for a job at that time. The next year, Enova came again to the career fair and, this time, I submitted my resume. I went through the interview process and was offered a position. 2. What do you do at Enova? I am a Senior Data Scientist in the Research, Architecture and Platforms (RAP) Analytics Team. 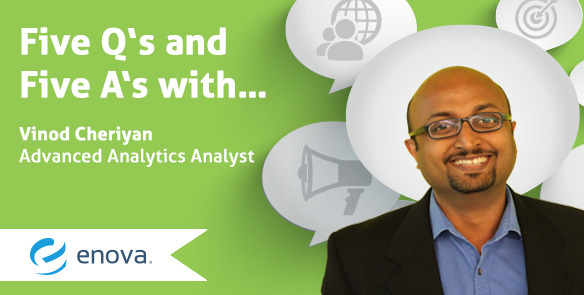 As part of my role, I work on designing and developing systems that make Analytics at Enova more efficient. I work on a variety of projects like investigating new methodologies and technologies, managing development of systems like CVCS (a central repository of all model variables) and Aegis (a model monitoring and workflow management system) and coding models in Mathematica to be deployed to Colossus, our analytics engine. I also give talks at conferences and help with recruiting for the Analytics team. 3. What’s the best part of working at Enova? Within the Analytics Team, we have a culture of managed autonomy. In simple words, this means that no matter what your level is, you are able to make a direct impact to the products and the business. I also love working with really smart people who are also willing to help each other. I would pick Dubai. I have visited Dubai a number of times since my sister is settled there. It is a very multicultural, open and modern city and is centrally located with easy access to the U.S. and to India. 5. What are your top three desert island must-haves?